SASA STANDS UP AS A SURVIVOR OF GENDER BASED VIOLENCE. 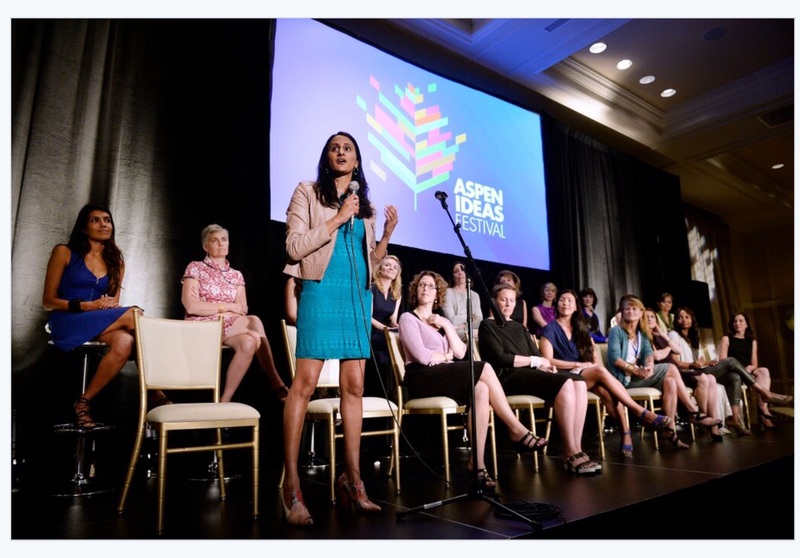 If it is how our women are dealt with by those in power and protected by our justice system then our country will continue to lose its vital human : our women. We need to continue to say NO to violence against women through mass media and campaign to change behaviors and attitudes that condemn the victims and condone the offenders. We need to ensure that business as usual with just compensation and no full,prosecution is NOT acceptable and court officials involved in protecting offenders and corruption in court must be punished with the ANTI-CORRUPTION LAW. We need to put our Courts in order? 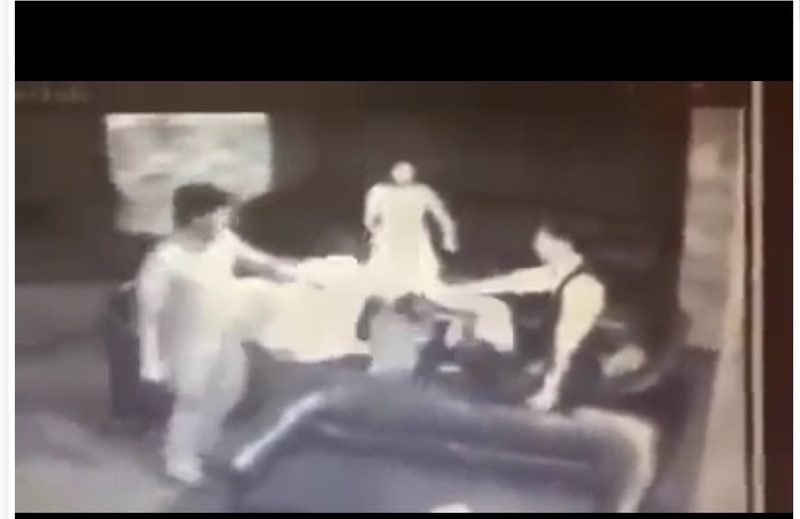 SASA STOOD UP TO PROTECT HER FRIEND WHO WOULD HAVE BEEN SEXUAL ASSAULTED BY THE TYCOON. SASA TOOK JUSTICE INTO HER OWN HAND AND DEMANDED FULL PROSECUTION, NOTHING LESS. SHE HAS SURVIVED A TRAUMA AND SHE IS NOT THE ONE TO BE BLAMED. SASA’s FATHER STANDS WITH HER FOR JUSTICE. THE SOCIETY MUST STAND WITH THE VICTIMS AND SURVIVORS OF GENDER BASED VIOLENCE TO END THIS SERIOUS FORM OF VIOLENCE. 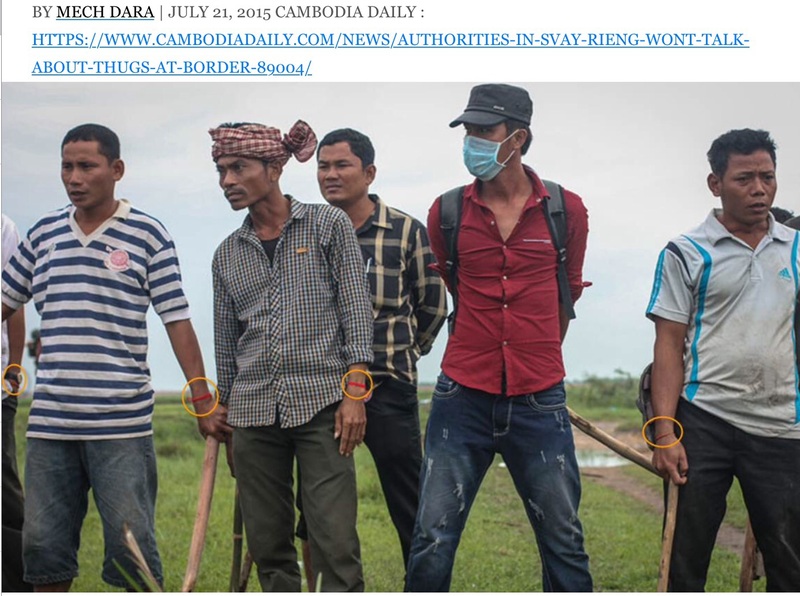 Hired thugs with arm bands and their tools to attack protesters, journalists and other targets. Video footage of Meach Sovannara making an appeal for non- violence while standing next to me the day we gathered at Freedom Park was never used by the Court. He is now guilty with 20 years in jail. 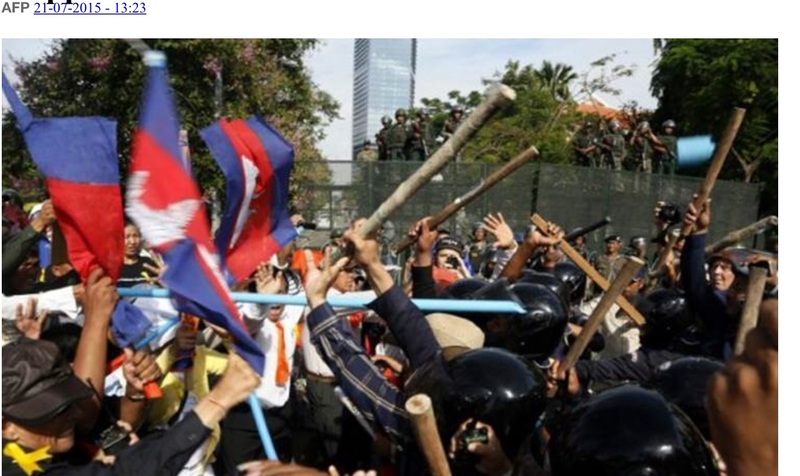 Hired thugs with batons; CNRP protesters with plastic poles and flags at Freedom Park. The batons used by the hired thugs being off loaded from the police trucks were captured by video and instantly posted on Facebook . That evidence was never used by the Court. The defendants could not identified any of the accused during the trial, yesterday. Armed police forces on hand to arrest the defendants while the Court was deliberating its decision . 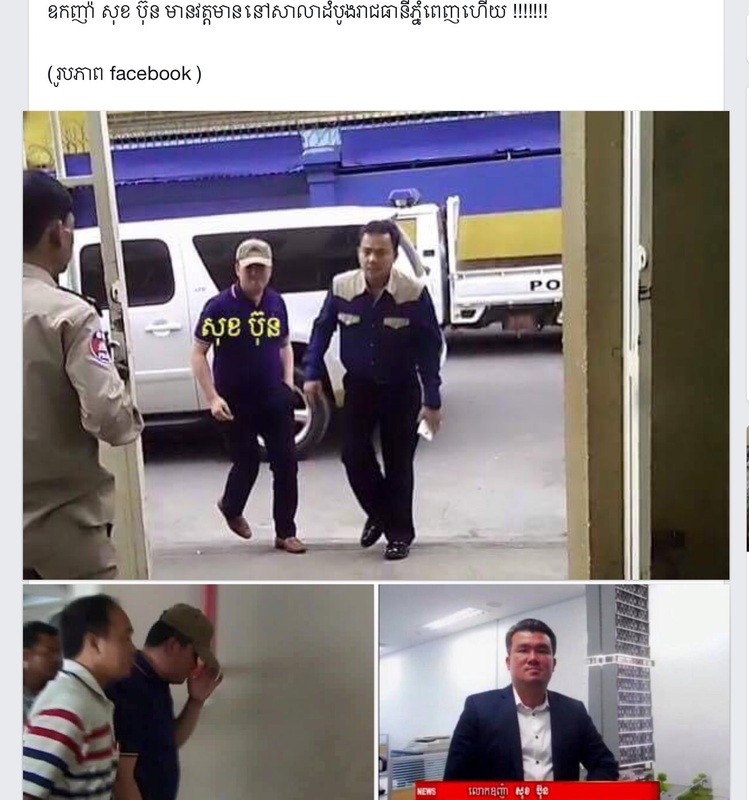 CAMBODIA KANGAROO COURT SHOWS ITS FACE AGAIN. 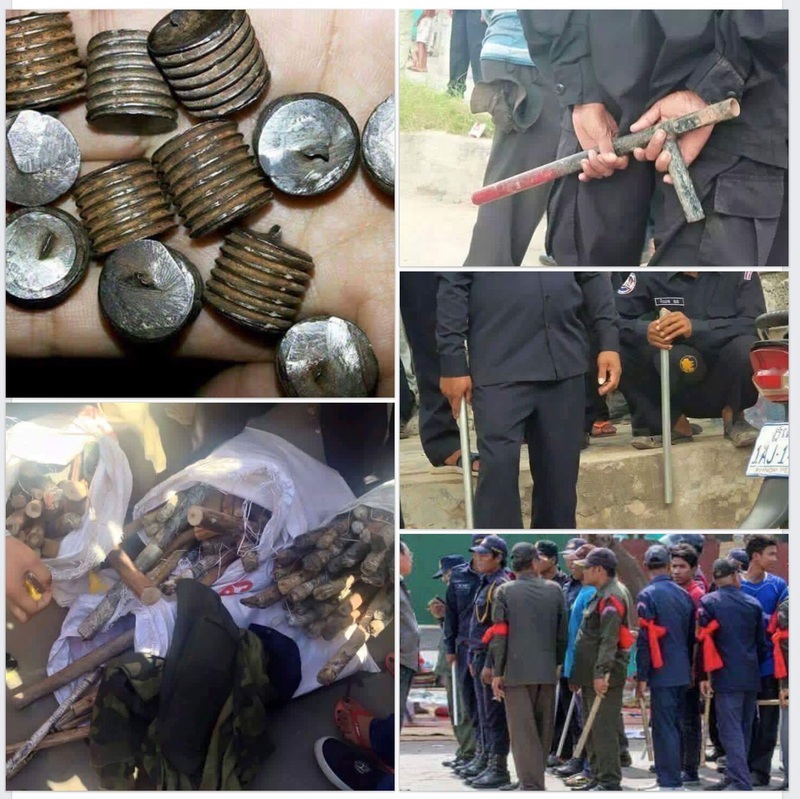 THE HIRED THUGS HAVE NEVER BEEN PUT ON TRIAL FOR THEIR BRUTAL FORCE USED ON PROTESTERS. 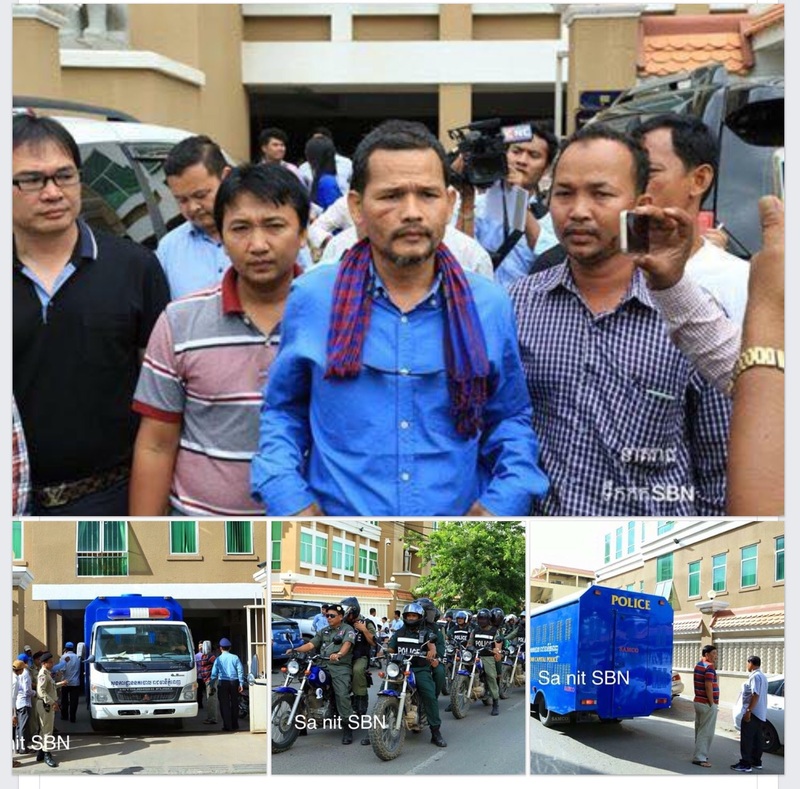 THE COMPLAINTS FILED BY CNRP AND OTHER VICTIMS HAVE NEVER BEEN INVESTIGATED. 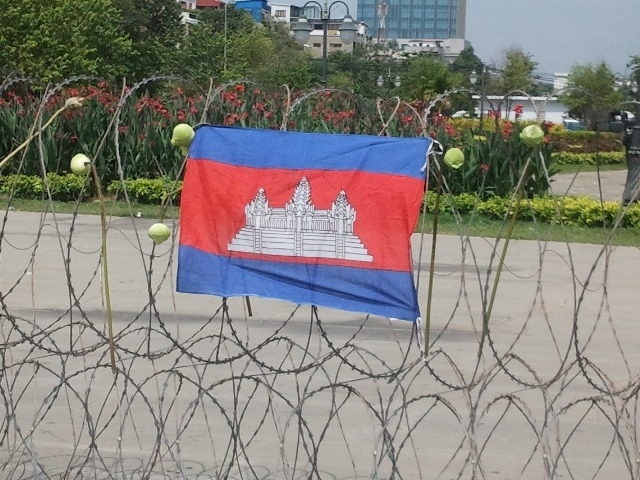 A VERY SPEEDY PROCESS WHEN CAMBODIAN COURTS WANT TO TAKE ACTION. The municipal Court has charged the tycoon under Art. 218 of 2009 Criminal Code : assault with aggravating circumstances . If found guilty, 2-5 years imprisonment with fine. 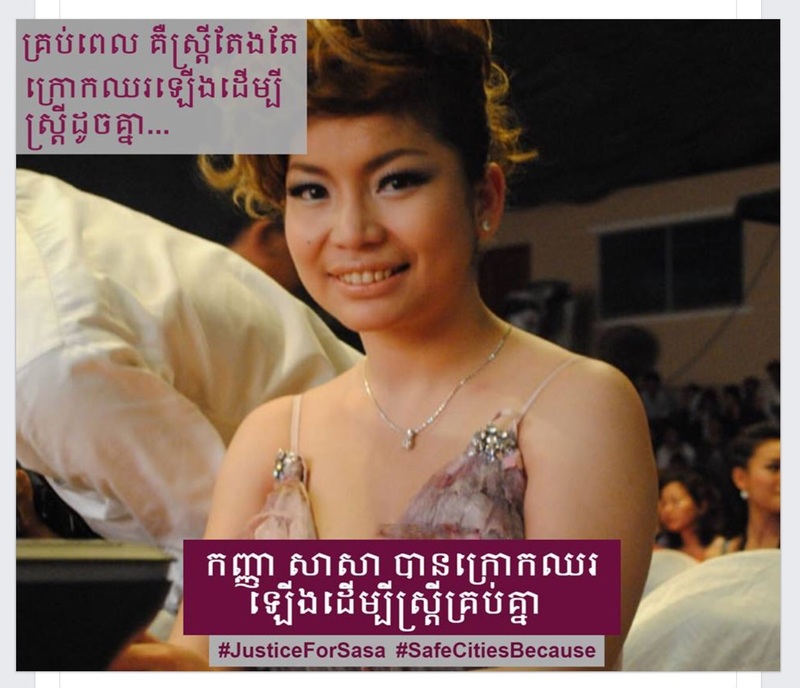 2nd step for justice for SaSa, the victim. 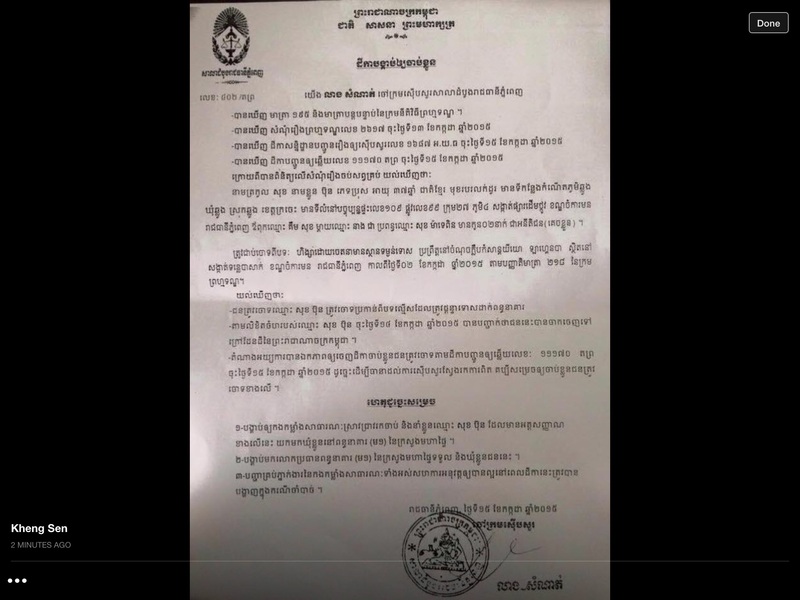 Order of the Court issued for pre-trial detention. 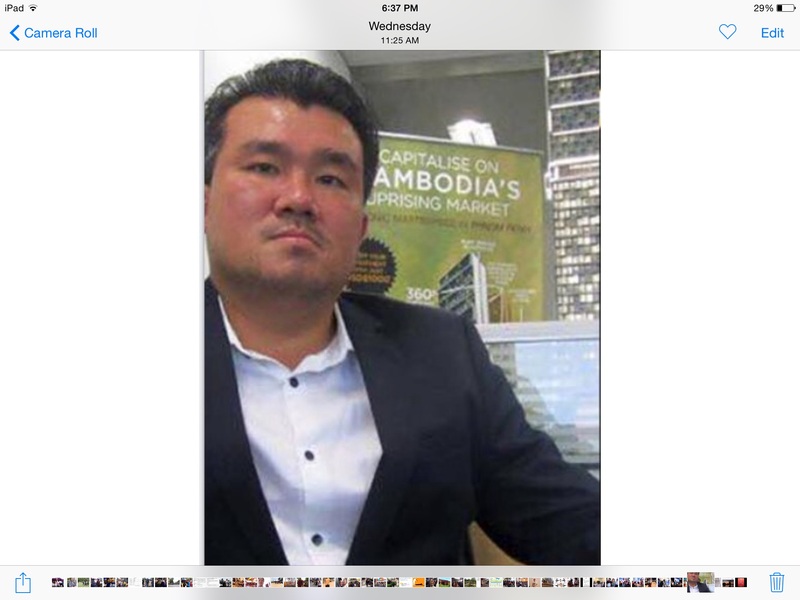 Tycoon arrested upon return from Singapore. Questioned by municipal court. i suspect a deal has been made. At least SaSa who was brutally assaulted can see sign of justice.